This kind of follows on from The Tux and The Woman post, or at least links back to it. So in the photo of myself I was wearing a lace tie from Marwood. And it is Marwood that I wish to write about today. Simply, Marwood make and supply the most exquisite ties you will have seen. Each tie using traditional English lace woven to form unexpected and intricate contrasts in colour and pattern against the English silk or cotton linings. Their first collection was launched in January 2011 and they have since produced two more ranges for 2012 – each getting better and better with subtle variances of design. The range has been slowing expanding over the last few years and they are stocked in some great stores across the world including Liberty UK, Harvey Nichols Hong Kong, Barney’s New York and Alureville Tokyo. Soon to be launching their own online store mid September. What I love most about their ties is how beautifully woven the silk designs are, creating gorgeous patterns unique to anything else I have seen before. 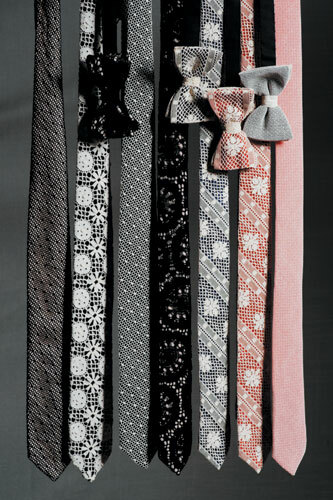 Ties that are suited for both men and women. This I can say with confidence – I own two of their ties, one of which was borrowed by a friend of mine for a wedding he was attending. He looked extremely handsome and stylish indeed! I seek out occasions in which to wear the ties as they are too good to be shut away in the wardrobe. They need to be worn with pride and they really do draw attention and comment.